With the game deep into injury time, it seemed that FC would have to accept defeat in this Southern League game played in freezing conditions. Brian Haule, so often the saviour of the team in the past, had other ideas and after receiving the ball with his back to goal, he performed a swift turn whilst under severe pressure before crashing the ball into the roof thereby sending Moles fans into delirium. A game at bogey side CSP was always a tough ask for new boss Davis Haule who named several debutants in his first line up. George Fenton and Josh Kirby for the home side made some of the early running with Kirby unlucky not to connect with a cross as early as the fifth minute. Debut boy Bradley Quamina suffered two injuries in quick succession and Ben Stevens replaced him in midfield, a position Ben is used to and indeed thrives in. This was the prelude for really should have been the opening goal of the game. 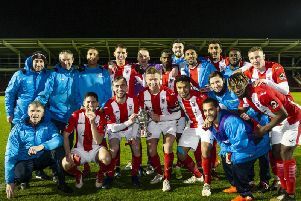 Brian Haule played in an intelligent forward ball, which Andre Olukamni connected with only to see the effort saved by keeper Carl Dennison. Ben Stevens followed up the rebound but he saw his effort drift just of the post. Josh Bamford had a fair chance just a minute later but this time Dennison saved with his feet. The only goal of a cautious first half went to the home team. On the cusp of half time Josh Kirby nodded down a left wing cross and striker Jake Cass struck the ball with ball from just a few yards for 1-0. This could have been the signal for FC heads to drop but instead the Moles found a new sense of urgency. Andre Olukamni broke clear on the left and after drawing the keeper out, he hit an effort which crept agonisingly wide of the post. Alex O’Brien then hit a forceful shot from the edge of the box, which possessed both power and accuracy and this was only equalled by the low save of Dennison. Pink forced Ashley Jenkins into a useful save with another flash shot but FC were soon back on the attack and this time Davis Haule hit a pin point shot which Dennison did will to react to. Alex O’Brien broke the home team’s offside trap on 75 minutes and after drawing the attention of the keeper, he passed to Ty Deacon and the young striker had the simplest of chances in crashing the ball home to reduce the arrears. A melee that saw Davis and Ben Stevens both booked showed the team’s fight and a Jordan Jenkins’ header almost brought FC onto level terms however; it appeared for all the effort, there would be nothing to show until Brian’s late late show.